Luxurious one double bedroom with large jacuzzi. Set on the hillside above Kalkan there are amazing views from the terrace and the pool is unseen from outwith the villa. 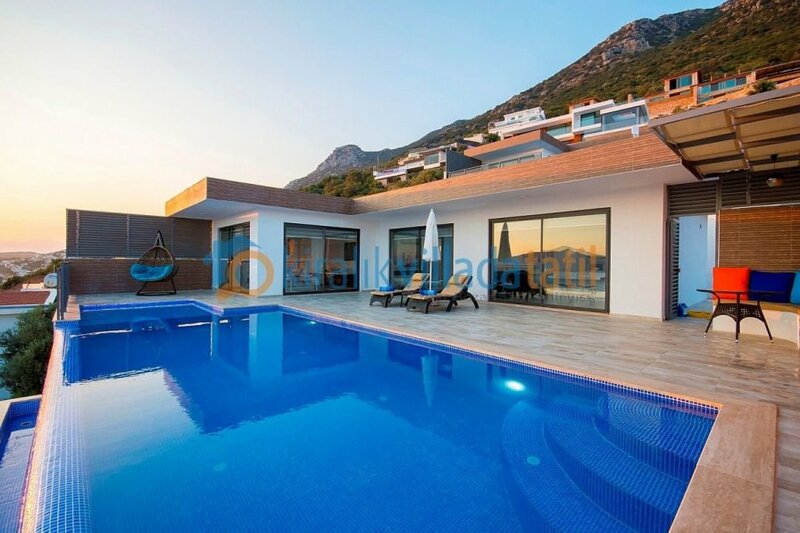 The brand honeymoon villa is located in the foothills of the Taurus Mountains, in the Kordere district of Kalkan. With one large double bedroom it has a capacity of 2 guests. Designed with privacy in mind, the pool is unseen from outwith the villa , making it an ideal choice for those guests desiring such an environment , be it for religious or other reasons. The views from the villa are breath taking, with panoramas out across Kalkan Bay and beyond. The accomodation consists of a large open plan lounge / kitchen / dining area and a spacious double bedroom, with an en-suite bathroom. In addition to this there is a massive double jacuzzi in the bedroom. The villa is equipped with all the fittings and fixtures that would be expected in a luxury villa and provides a magnificent setting for an unforgettable holiday. The villa is accessed by a flight of steps making this villa unsuitable for guests with mobility problems. The villa is located up a steep hill approximately 2km from the centre of Kalkan making it difficult to walk into the centre. Guests staying may wish to use the reasonably priced local taxi service or rent a vehicle.